In December, you can easily find me running around and peeking into every single Holiday market stand, sipping egg nog directly from the box, inhaling the smell of live Christmas trees by the Morgan L stop and dragging my boyfriend under every single mistletoe ("What do you mean that that branch is not a mistletoe? MUAH!"). In other words, I am a holiday sucker. Big time. 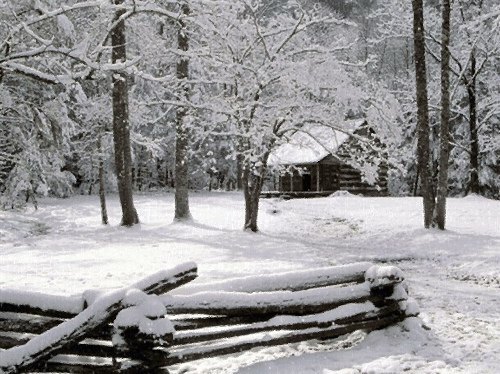 If you feel similarly, I am sure that you will more than appreciate the number of holiday markets popping up around our beloved pigeon town. At Bushwick Daily, we counted five of them happening in the upcoming two weeks. Make sure to check them out, take a big sip of the holiday atmosphere and support local vendors by shopping for presents there! 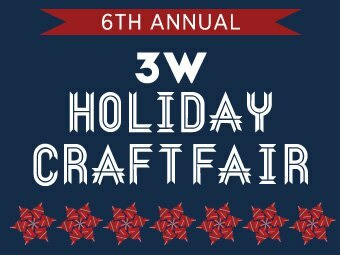 One of our fav music and cultural venues in Bushwick is organizing a lovely Holiday Market to take place over two long weekends. The backyard at Secret Project Robot will be transformed into a magic holiday village for gifts, drinks, food and music. Look forward to a community of Etsy sellers and excellent musicians. 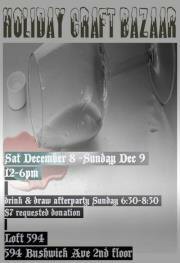 Loft 594, a new venue for artists in Bushwick run by artist Patricia Maldonado is promising a Holiday Craft Market done Bushwick style! 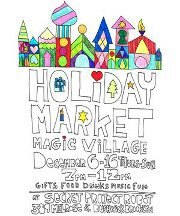 Creative and fun gifts from local artists and crafters, tarot card readings and live music! Hot apple cider and holiday cake will make you happy you're alive, and if that doesn't then kittens will. There will be kitten adoptions on Saturday. 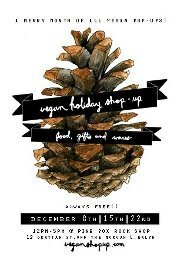 Also Roberta's is having a Holiday Market! Done in a very Roberta's fashion, the fair will take place in their garden. 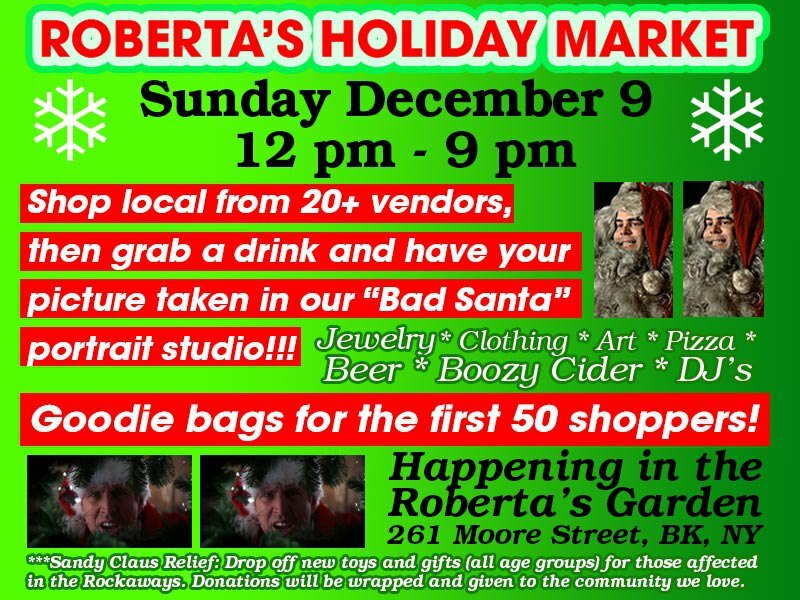 Roberta's is promising lotsa NYC based vendors, boozy cider, hot pizza, DJs, dancing, and a "bad santa" portrait studio! First 50 shoppers will receive a special goodie bag. Nice! Do you admire all the awesome items created at 3rd Ward? Well, now you can get them! 3rd Ward is promising terrific terrariums and bite-sized gifts of culinary awesome, cute kitchenwares and items to make your iPad a one-of-a-kind item. If you come early, you can get a limited-edition 3rd Ward tote bag filled to the brim with good stuff from all of the vendors. Good eats, treats and peeps! All that plus a lot of great gifts for your loved ones can be located throughout three upcoming Saturdays at Pine Box Rock Shop bar. Among many vegan vendors, you can meet and greet our fav Bunna Cafe, Ethiopian vegan foodies. Yay!! 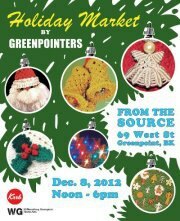 This Holiday Market is a bonus one as it is located outside of the borders of the Kingdom of Bushwick. Yes, it's all the way in Greenpoint. But we would like to give them a shout out because it looks absolutely fabulous with over 30 local vendors and it's organized by our BFFs, Greenpointers. Check them out!